Shortly after WW II, the Swiss Air Force acquired a number of 130 fighter aircraft P-51 "Mustang" from U.S. Air Force surplus. These aircraft transferred from occupied Germany to Switzerland by Swiss pilots were equipped with the standard VHF transceiver SCR-522. Because this crystal controlled set turned out to provide an excellent frequency stability and good voice intelligibility, the VHF transceiver with amplitude modulation was kept in service and was assigned the Swiss designation SE-013. Later, amplitude modulated telephony in the VHF range became standard for all aircraft communications and is still in use, the so called AIR band. four crystal controlled pre-tuned frequencies selectable from control box, power supply from 28 V on-board system by means of a dynamotor. 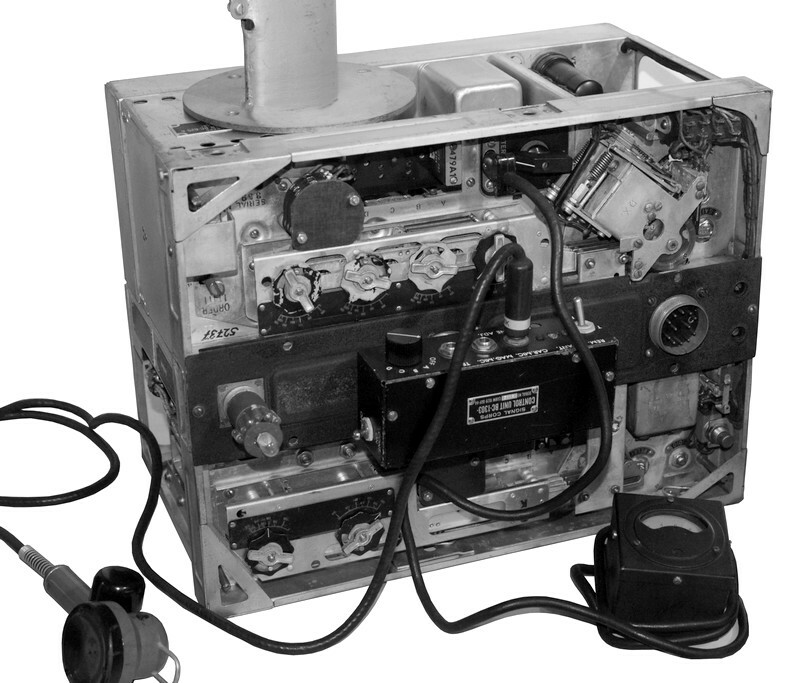 The Bendix Radio Corp. located at Baltimore developed the american standard VHF aircraft radio system SCR-522 from a prototype of the British TR 5043 in 1942. 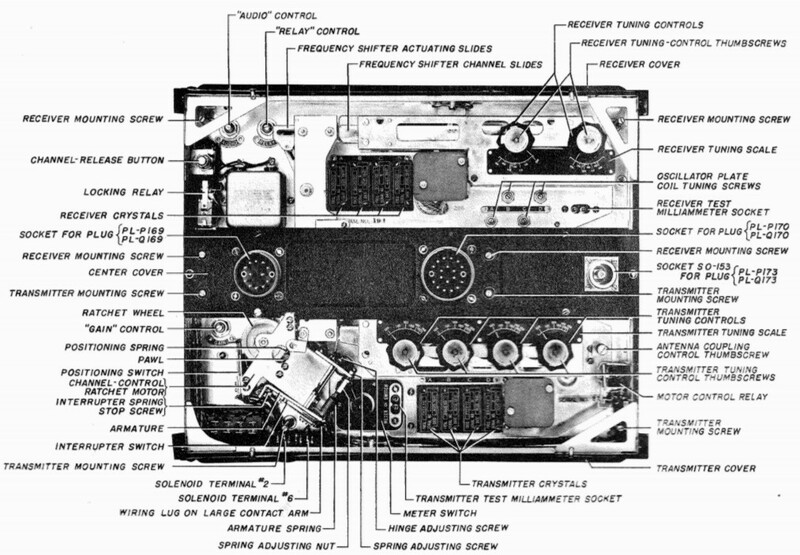 This transceiver was used in different U.S. (fighter) aircraft. When the Swiss Air Force acquired 130 fighter aircraft P-51D "Mustang" from american war surplus in 1948, the airplanes came with radio sets SCR-522 already installed. 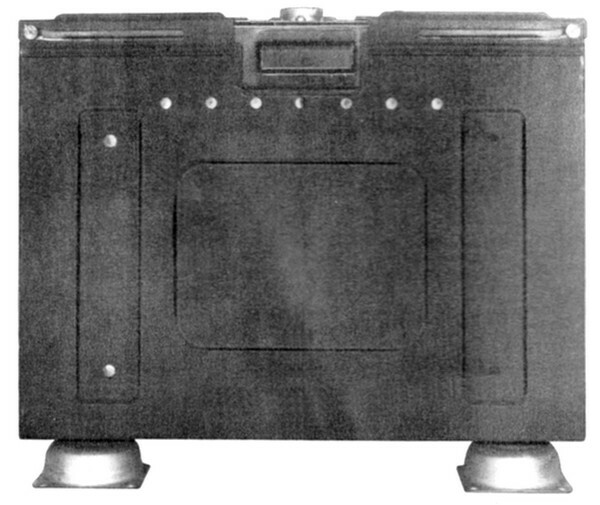 After the initial evaluation, it turned out, that the frequency stability was excellent (due to the design with crystal control) und the voice quality was superior (due to use of the VHF frequency range), a decision was made to keep the SCR-522 in use, they were assigned the Swiss military designation SE-013. There was one major shortcoming: there were no VHF band ground stations in service in Switzerland. So the technical department of the Swiss Army constructed from reserve receivers (intended to be kept for spares) and replacement parts complete wireless stations. 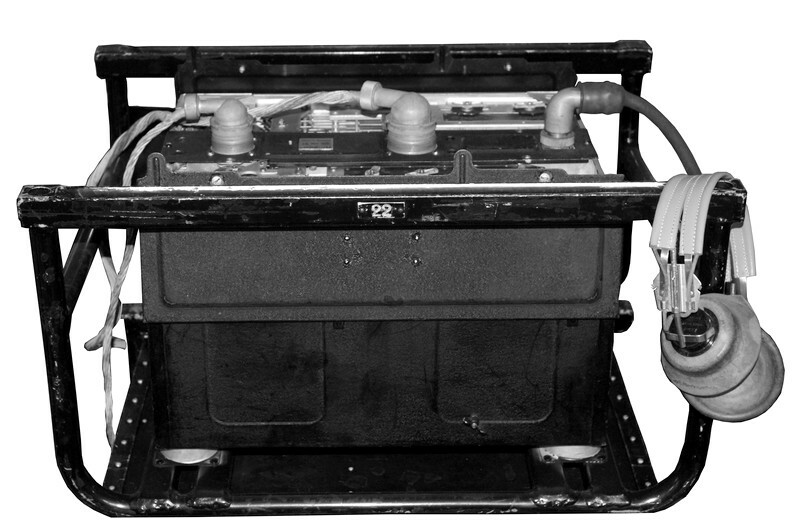 When installed in a metal rack together with a mains power supply, they served as improvised ground stations (see SE-013 t/f). The VHF station consists of a transmitter BC-625 and a receiver BC-624 mounted together in an encasement CS-80-A with the rack FT-244-A with internal cabling, a Dynamotor PE-94-A is used to power the station from the aircraft's 28 V DC power system. The frequency is selected by the operator at the Radio Control Box BC-602-A. In the transmitter a 6G6C valve is used in the oscillator, the frequency is determined by a crystal resonant on a frequency which will be one eighteenth of the operation frequency. In the "First Harmonic Amplifier", the first frequency multiplier stage, a 12A6 valve is used; in the "Second Harmonic Amplifier", the second frequency multiplier stage and in the RF output stage, two 832s are in use. In the AF amplifier stage, the speech signal coming from the microphone is amplified by a 6SS7 valve, in the following modulator stage, two 12A6 are in use. A second 6SS7 is used as rectifier for the RF level indicator. In the receiver section, the receiver oscillator (12AH7GT, double triode) is resonant on one of the four switchable receiving crystals.It's frequency has to be calculated from (Operation frequency-12 / receiver harmonic number), the correct receiver harmonic number of the frequency multiplier stages has to looked up in a table in the technical manual TM 11-509 and lies between 11 (100-108 MHz range) and 18 (156 MHz). A harmonic generator (valve 9002) will generate a harmonic of the receiver oscillator fundamental frequency, the corresponding harmonic is filtered, will be amplified in the harmonic amplifier (valve 9003) and fed to the mixer stage. The incoming RF signal from the antenna will pass an RF amplifier stage (valve 9003) and then will be fed to the mixer stage (valve 9003). The intermediate frequency will be amplified in three IF amplifier stages (three valves 12SG7) and then will be demodulated in the detector stage (12C8). This valve also acts as AF preamplifier, the audio is amplified again in the AF final stage (12J5GT). After all operation frequencies have been pretuned by ground personnel at the airfield, all necessary ccrystals have to beinstalled and the quite complex tuning procedure of the transmitter and receiver has to be completed, the station stored in the back of the aircraft is remote controlled from a Radio Control Box BC-602-A by the pilot. 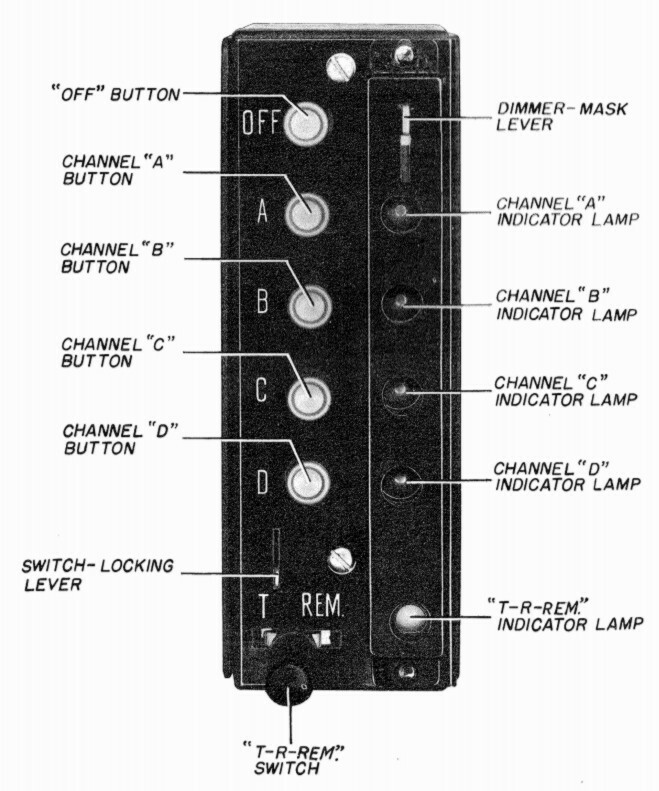 On the control box front panel, all four channels can be selected by pressing pushbuttons, an indicator lamp will indicate the active channel, the operation switch sets the radio to transmit ("T"), receive ("R") or remote ("REM") mode.. The aircraft P-51D "Mustang" remained in duty until 1957 and served as fighter and reconnaissance aircraft, until they were finally liquidated. e: www.swissmustangs.ch: Martin Kyburz' excellent website about the Swiss Airforce "Mustangs".